LG might soon launch a new mid-tier smartphone with a two-year-old chipset. 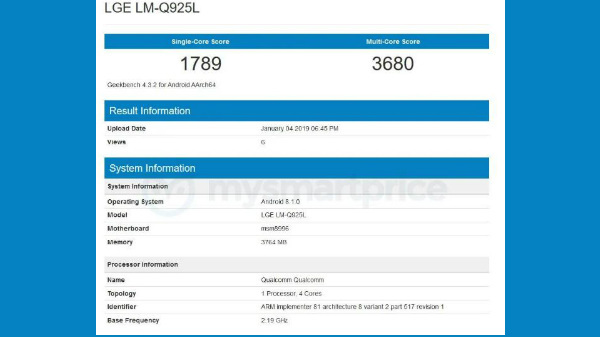 A new LG smartphone named LG Q9 Pop has been spotted on GeekBench, revealing the actual specifications of the smartphone. Here are the complete details on the upcoming LG smartphone. The LG Q9 Pop scores 1789 points on a single core and 3680 points on multi-core performance. The smartphone comes with 4 GB of RAM and runs on Android 8.1.0 Oreo OS. These scores on point with the other smartphones with the Qualcomm Snapdragon 821 SoC. The LG Q9 Pop is speculated to feature a 6.1-inch IPS LCD screen with FHD+ resolution (2280 x 1080p), protected by 2.5D curved tempered glass. The smartphone will come with 4 GB of RAM and 64 GB of internal storage with a micro SD card slot for additional storage expansion. With respect to optics, the smartphone will come with a 13 MP primary RGB sensor with 1080p video recording capability and an 8 MP selfie camera with similar video recording capability. Like most of the mid-tier and high-end LG smartphone, the Q9 Pop is expected to come with IP68 rating for water and dust resistance. The LG Q9 Pop will have a dual SIM card slot with support for 4G LTE and VoLTE on both slots. Additional connectivity features include Bluetooth 5.0, dual channel WiFi (802.11 a/b/g/n/ac), GPS with A-GPS, GLONASS, BeiDou and NFC. 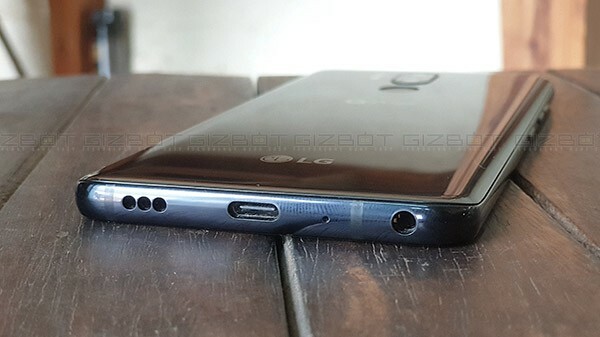 The smartphone is expected to house a 3500 mAh Li-ion battery with support for fast charging via USB type C port with a dedicated 3.5 mm headphone jack. The LG Q9 Pop runs on Android 8.1.0 Oreo with custom LG skin on top. As of now, there is no information on the launch of the LG Q9 Pop. The smartphone is most likely to launch initially in South Korea, and the device will trickle down to other markets like India and China.